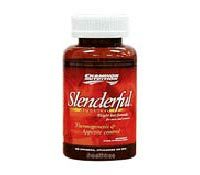 Slenderful helps facilitate permanent weight loss by supporting your natural ability to burn fat, maintain muscle, and control appetite, and by teaching you food choices that actually promote burning fat – without counterproductive, ineffective, controversial, or potentially harmful ingredients, such as diuretics, ephedra, or PPA. Slenderful represents a totally new approach to the design and function of weight loss products. It is formulated to help address the “10 Metabolic Factors” that prevent you from losing excess body fat. The end result: you lose fat faster and more consistently with less stimulation. Suggested Use: Begin by taking one slenderful caplet three times a day, about 1/2 hour to 1 hour before meals. You may take a maximum of 3 caplets at a time, four times a day with dosages at least four hours apart, but take the minimum dose that results in a mild feeling of warmth or appetite suppression. Do not take within four hours of bedtime. Do not take the maximum dose for more than two weeks. Do not take the Slenderful caplets for more than eight weeks without a two week break. Do not exceed recommended dosage. Caution: These statements about Slenderful have not been evaluated by the Food and Drug Administration. Slenderful diet pills are not intended to diagnose, treat, cure, or prevent any disease.